Vouchers! Receipts! Bills of exchange! The paperwork of empire, particularly that of credit and finance, is probably not what gets most of us up in the morning. 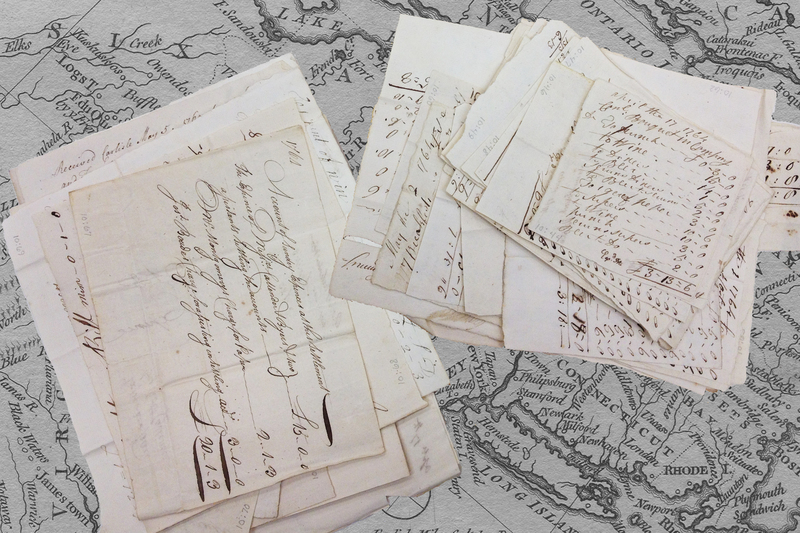 In the archives, we skip over the dull sections of the finding aids—warrants, no thanks!—and instead dive into correspondence and maps and bound volumes and clippings. The more adventurous of us might even call up account books—but those individual receipts? They’re lucky if we ever take them out of the box. And why would we? Unless we live in a world of down-and-dirty finance or economics or material culture, they seem not only besides the point, but, even more, incredibly hollow. What do we get from reading a quick statement that someone was eventually paid for delivering a barrel of pickled cabbage in 1760? Especially when we can read in frantic detail the correspondence about how that barrel fell into the Mohawk River, burst open, got hauled back onto a bateau, arrived at Fort Stanwix, was re-opened, reeked, was declared unfit for consumption, continued to reek, was declared fit for consumption, reeked some more, ordered northward to Oswego, reeked still, and finally was delivered to a garrison comprised mostly of Germans who (our correspondents assumed) would think they’d been gifted sauerkraut. It’s the correspondence, we might argue, that gives us actors and action. In it, even a barrel—brown, wooden, boring—becomes something dynamic. But who delivered that barrel? How long did it take him? Where did he begin his trip? Was he a merchant contractor, a militia man, a professional sled driver? And what did he get out of a journey, in the dead of winter, through the type of paralyzing cold you can only feel in upstate New York, with barrels of spoiled pickled cabbage? Exceedingly important questions like these suddenly make the boring, bland, bureaucratic paperwork appear just a little (a very little?) more interesting. By casting receipts and vouchers (as well as warrants and accounts) under the strict purview of economic and fiscal historians, we’ve lost some of the best sources available to us to recover “ordinary” people. That’s the beauty of something as tedious as cost and payment—someone has to pay and someone has to get paid. May 16, 1764. Tobias Schenck, with 1 wagon, was employed in transporting baggage of the Royal American Regiment from his home in Lancaster westward to Carlisle. For his service, which took four days from Lancaster to Carlisle, he received of the British Empire’s official contractors (Plumsted & Franks) almost 5 pounds. Payment was quick, given by the Lancaster-based agent, a Mr. Simons, just 5 days later. In all 135 volumes of the Pennsylvania Archives, there is no record of a Tobias Schenck (or Schenk, or Shank). Because he wasn’t part of the Royal Army or the Pennsylvania Regiment, the name Tobias Schenck never made a muster roll or regiment list. Letters between Henry Bouquet and Thomas Gage regarding the preparations for the 1764 campaign to Ohio certainly never mentioned a Tobias Schenck. But Tobias and at least 20 other Lancaster-based men were responsible for the transportation and carriage of troops, baggage, ordnance, and stores that propelled the key 1764 Bouquet Expedition to the Ohio. One benefit of studying an era of war and warfare is the sudden proliferation of muster rolls and regiment lists, records that allow us to thumb through lists of those who fought (and died) and whose names never got to see a contemporary printed page or grace the letters of their commanders. But so many other men and women integral to the same moments of conflict—small-time, often single-time transporters, traders, interpreters, and so on—are left out in the cold. If we rely only on correspondence—or even on account books and warrants (which, without all their annexed receipts and vouchers, are only basic summaries)—we have little chance of reviving them. Receipts and vouchers are more than just mechanisms of credit and bureaucratic paperwork: they’re a window into the lives of those who built roads, carried artillery, brought much-needed succors, and much more. Thanks to scholarship exemplified by John Brewer’s Sinews of Power, we’ve accepted—and rightly so—that these sources are evidence of state power, that they make up the tissue of a growing, living, breathing organism of eighteenth-century fiscal government. But by seeing these sources in their aggregate form, we’ve also assumed that they are only that. Even when we take the next step, if we only wade into warrants and accounts, and not deeper to the level of receipts, vouchers, bills of exchange and their specificities, we’ve missed their other potential. We can see power and the powerful. But we can also rediscover the nameless, faceless, and forgotten. The German troops may also have rejoiced at their good fortune as scurvy began to strike. Thomas Gage to Eyre Massey, Albany, 22 February 1760, Thomas Gage Papers, Letter Books and Account Books Series, Box 1, William L. Clements Library, The University of Michigan. Warrant, Gage to Mortier, New York, 3 May 1765, Warrants May. 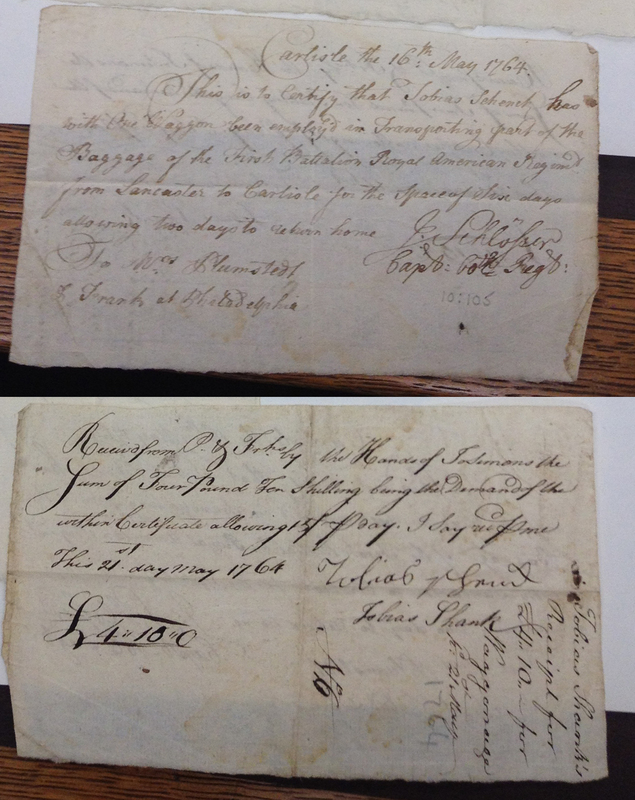 1765, Series 2: Warrants, Box 11, Thomas Gage Warrants, William L. Clements Library, The University of Michigan. We also learn a little about Tobias himself. His single wagon was outmatched by the 2 or 3 or 4 used by every other contracted man, so he probably was either young or poor—or likely both. He lived in Lancaster and his name betrayed that he was either Swiss or German. He may have been related to the other Schenck employed as a waggoner on the communication to Carlisle—Michael Schenck—for whom there is a more robust documentary record. As someone whose dissertation relies heavily on scouring merchant correspondence for all sorts of non-financial information, I wholeheartedly endorse your sentiments here. I’ve lost count of the number of fascinating people I’ve subsequently discovered because I read their name on a bill of exchange or saw them listed as a factor in some far-flung colony and went to investigate. It seems to me most of the really fascinating stuff being written about empires these days takes the boring paperwork seriously and draws out personal narratives to highlight the intersection of the day-to-day and the imperial, whether that’s the economic, political, religious, military or social context. You mention John Brewer, who I think you’re right to anoint as the progenitor of a lot of this kind of history, but I think it’s also worth mentioning people like K. N. Chaudhuri, Phil Stern and Hugh Bowen, who have also done a great deal to make the “boring” paperwork of the East India Company come to life in British India in their respective periods. Absolutely right – there’s so much stuff in these dockets and vouchers! One unfortunate reason they haven’t been used as much as they should is that so many historians are innumerate – tax returns are difficult enough. But I think another reason is that, until digital photography became commonly used in archives, it was extremely difficult to copy such documents accurately. I’ve transcribed them over the years, then an update in my word program changes the font, and suddenly all the tabs are wrong. Or similar… Add to that the problems with mercantile abbreviations and the multiplicity of personal names and copying was hard work. It’s worth remembering that all those clay tablets in linear B, like all those knotted strings (sinews indeed!) in the Meso-American quipu finds, were accounting records.